Benefits of Order and Inventory Management | Orderhive benefits? 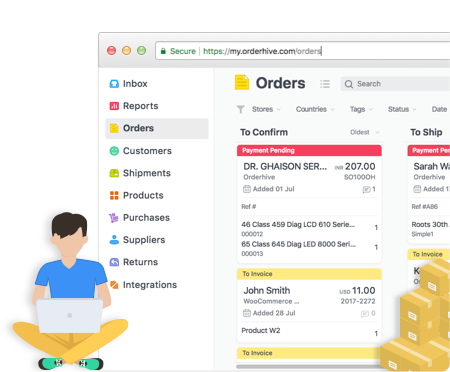 We built Orderhive with one thing in mind: to help retailers and sellers simplify their back-end tasks. Our goal is to make running your business easier, by providing you with a seamless back-end workflow that gives you the confidence to grow your business. Have you ever been in a situation where you’ve received an order but unable to fulfill it due to no stock? Orderhive’s inventory management software gives you real-time oversight of your inventory across all sales the channels you deal with, so you can see at a glance how much stock you’ve used, how much is left, and what actions you can take. Never run out of stock again with Orderhive. Don’t waste any more time switching between platforms. Orderhive provides a simple inventory control solution that lets you see your inventory levels across all your online stores, from one easy location. Any changes to stock are automatically updated across all your channels, so you’re always up to date. Whether you receive a handful of orders, or even thousands of orders in a day, Orderhive lets you process and ship multiple orders from one admin. You’re able to assign orders to different suppliers using our dropship management and eliminate any fulfillment hassles, leaving you with a smoother, simpler way to take more orders and grow your business. Orderhive gives you clear oversight of all your stock, orders, customers and suppliers. When a sale is made in any of your integrated stores, Orderhive automatically updates the stock levels across all channels, meaning you avoid any mistakes made through manual entry, double handling, and plain old human error. As and when your business grows, you need a more robust and customized system to meet specific requirements. Orderhive Plus is here to help. Orderhive can be customized according to suit your business needs, with plans that suit your budget. No matter how big your business gets, Orderhive is a simple, scalable platform that synchronizes all your business data into one centralized point, so you can concentrate on building the business you’ve always dreamed of. Optimize your business performance in real-time with all your inventory, orders, and customer data available through Orderhive’s easy-to-use, attractive dashboard. You get analytics that are easy to understand, detailed reports that actually make sense, and all the data you need, when you need it, to make decisions that will see your business grow. Integrate your different selling channels, couriers, and accounting software into one simple dashboard. We transfer and backup all your data using 256-bit SSL encryption, and run regular security vulnerability scans and tests, to make sure your data and your business is always secure. There’s nothing to download, Orderhive is a cloud-based software application. All you need is an internet connection. You’re not tied into any long-term contracts, so you can upgrade and downgrade your plans so it suits your business needs. We’ve made Orderhive easy to use, but if you do need any help our experts are always available through chat, phone, and email, 24 hours a day, seven days a week. We’ve got your back when it comes to growing your business. The Orderhive dashboard is a simple, intuitive interface, that lets you navigate and use our system easily and efficiently. After all, if it wasn’t this easy, what would be the point? Pay only for what you’ve used. We provide a usage meter where you can track your total usage and upgrade or downgrade your plan accordingly, so you’re always getting the best price and plan for your business needs.